Out with a suddenness that instantly places us miles away across a field of wheat. 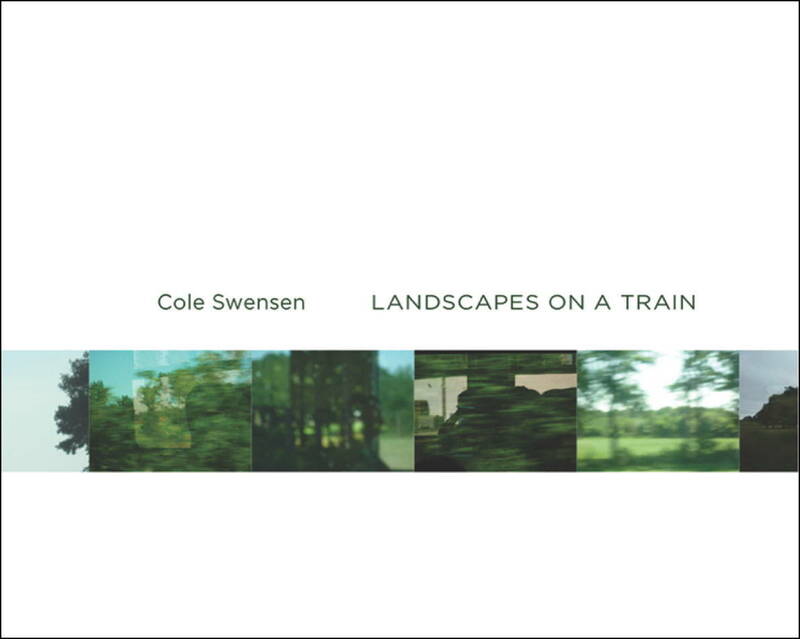 Influenced by the history of landscape painting, Cole Swensen’s new book is an experiment in seriality, in the different approach and scope that language must take to record the way that fluctuations of minutiae transform a whole. These poems meditate on what it is simply to look at the world, without judgment, without intervention, without appropriation. Swensen’s lyric observations, lilting and delicate, distill the act of seeing. The author of more than a dozen poetry collections, Swensen has long favoured constructing poetry collections around a central theme or thesis, from hands to gardens to ghosts. What might have been explored through a more expansive detail in previous works, Swensen’s touch across the poems of LANDSCAPES ON A TRAIN display a lighter touch. One might suggest that this is less a book about capturing the shifting views of landscapes than about describing the interplay of light across a screen, canvas or window. Through her lines, light shifts, shimmers and alters, refusing to remain static. An extended meditation constructed out of fifty-eight untitled, unnumbered prose-poems, each accumulated section of LANDSCAPES ON A TRAIN suggest a series of quick notes composed during travel, capturing the details of landscape in the smallest brushstrokes, and held together to build into an essay on landscape and light around landscape painting during the Romantic (and even late Medieval) period. The cells of the trees, not what leads, the path down to the cells below the trees. The poems that follow begin as a response to this manuscript, and specifically to the calendar section that opens this and all traditional books of hours. The calendar lists the principal saints’ days and other important religious holidays of the medieval year in a given region. In keeping with the cyclical rhythm of a calendar, the poems follow the sequence of days and months and not necessarily that of years. Poems titled the first of a given month bear a relation to the Trés Riches Heures calendar illustration for that month, though they are not dependent upon it. Rather, they – like all the pieces here – soon diverge from their source and simply wander the century. And finally, they are simply collections of words, each of which begins and ends on the page itself. Andy Fitch: Could we first contextualize Gravesend amid a sequence of your research-based collections? Ours, for example, comes to mind. What draws you to book-length projects, and do you consider them serialized installments of some broader, intertextual inquiry? Does the significance of each text change when placed beside the others? Or do they seem discrete and self-contained? Cole Swensen: They revolve around separate topics, yet address the same social questions: How do we constitute our view of the world (which, of course, in turn constitutes that world), and how does the world thus constituted impinge upon others? Ours examines an era in which science put pressure on definitions of nature. We cannot pinpoint when such pressures started, but 17th-century Baroque gardens give us a chance to focus on this pressure and question the accuracy and efficacy of making a distinction between science and nature in the first place. In short, both books question how we see, and how this shapes the world we perceive. Ours examines 16th– and 17th-century notions of perspective in relation to conceptions of scientific precision, knowledge, beauty and possibility in Western Europe. Gravesend poses quite different questions, foregrounding that which we do not, or cannot, or will not see. Certain passages address this directly, such as “Ghosts appear in place of whatever a given people will not face.” Communal guilt and communal grief remain difficult to acknowledge because our own lines of complicity often get obscured. Perhaps our inability to deal directly with such guilt and grief causes them to manifest in indirect forms. The English town of Gravesend offered a site through which to examine this because it can be read as emblematic of European imperialist expansion—a single port through which thousands of people emigrated, scattering across the world, creating ghosts by killing cultural practices, individuals, and in some cases, whole peoples. But the word “Gravesend” also hints at an after-life, a life that exceeds itself. The town of Gravesend stands at the mouth of the Thames. When people sailed out of it, they cut off one life and began another. So the concept of a grave as a swinging door seemed crystallized by the history and name of this town. And ironically, the first Native American to visit Europe, i.e., to have gone willingly (even before Columbus, many had been kidnapped and brought back to Europe, but), the first who seems to have regarded it as a “visit,” died in Gravesend, as she waited for a ship to take her back to Virginia. The New World, the Western hemisphere, finally capitulates to Europe, and dies of it.